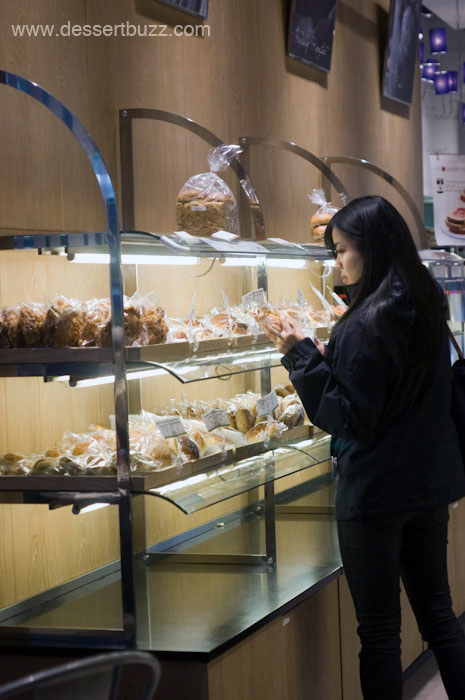 You have to love Paris Baguette. Their baked goods are always fresh and super-dependable and they always have something new on offer. 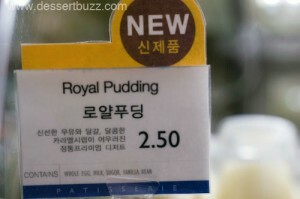 On Sunday, I spotted their elusive “Royal pudding” product. 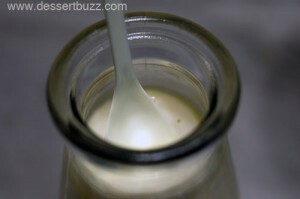 It comes in a very distinctive miniature glass milk jugg. I had seen reports of this product before on the West coast but never in New York. Essentially, it’s a super-creamy, milk-based pudding, in this case, with a vanilla flavor. 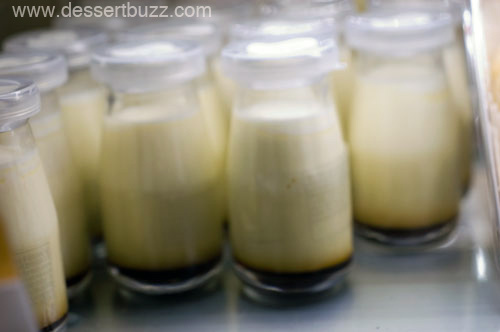 On the very top is a cream layer like on the top of a Brown Cow yogurt. Then, on the bottom is a pool of runny vanilla carmel (think flan). They give you a special long thin spoon to eat it with too. Very cool at $2.50 –plus you get a cool reusable glass jug! I also felt compelled to buy at least one “strewed bread” –which almost every patron seem to have at least one of. 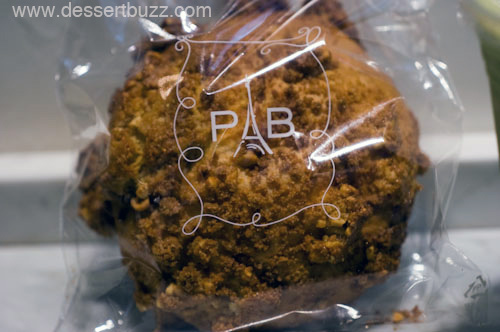 It’s a sweet, spongy, brioche-like roll topped with brown sugar and peanut crunch. The topping reminded me of a coffee cake. Despite the fact that I was there at 4 p.m. on a Sunday, my strewed bread was very fresh. And for $1.50 you just can’t beat it. 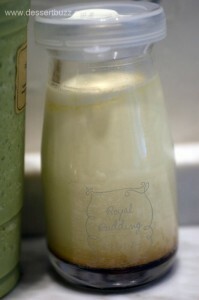 Finally, I also bought a Paris Baguette Green Tea Frappuccino for $3.95 which is large in size and small in flavor. On the plus side, it’s sweet but not tooth-achingly sweet like the frappucciono’s from Tim Hortons or Dunkin’ Donuts. The sweetness didn’t seem to be stopping about half the customers from guying one while I was there. Recommended: Vanilla royal pudding $2.50, strewed bread $1.50, other various fresh baked goods. Paris Baguette is located at 6 W 32nd St. Their website is useless so here is MidtownLunch’s coverage. I love that pudding and the jar is so cute! I really wish you and Danny would cease posting about French stuff! Lol. yes, very VERY French. In fact if you sepnd over $100 you get black felt beret and mustache comb. It’s a Korean chain right? Funny – I just bought one of these yesterday bc the jar was too cute for me to pass up. $3 at the East Flushing location; they didn’t give me a spoon, but I luckily had a tiny spoon that fit (though a bit short). I was Googling to find out if someone could tell me why it’s called Royal Pudding and whose site should turn up but yours! 🙂 Pretty yummy though! Hi Yvo! So glad my site exists on the Google! Hope you are well! Love all the fresh pastries and bread here.Royal Pudding is exceptionally good-try the Mango flavor.Its very soupy but wonderful not your average puddung.I keep my glass containers they are cute and will come in handy for something.Central Square location in Cambridge is never crowded when Starbucks is(except on weekends))Give them a try!